But critics said the 'mass medication' of water without the population's consent was an invasion of their human rights. Fluoride, which is tasteless and odourless, occurs naturally but is also found in drinking water supplies - usually at levels too low to affect dental health. At present, only 10 per cent of tap water has fluoride added - in the West Midlands and the North East. But he dismissed the ' scaremongering that says it causes cancer'. 'A total of 170million people in America drink fluoridated water and it is the most litigious country in the world,' he said. 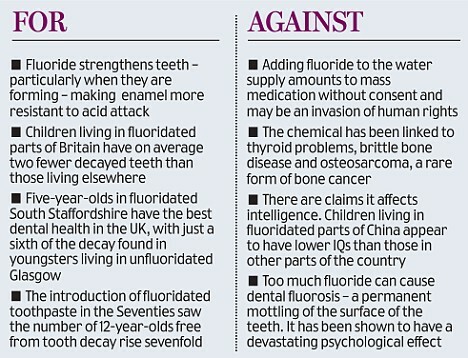 But Peter Mansfield, a Lincolnshire-based GP and expert on the effects of fluoride, said: 'It does work a little bit, but nothing like as much as dentists say it does, and it causes as much damage as it does good. Caroline Lucas, of the Green Party, said the European Convention on Human Rights states individuals have the right not to be medicated without their consent. The party is taking legal advice on a possible challenge. The Government, which has earmarked £42million to pay for the scheme, has agreed to pick up the costs of any legal claims. The Department of Health said water companies would only start fluoridating water following consultation with local people.